It was here between 1601 and 1692 that 91 people were burned to death, hanged, or subjected to trial by water, all on accusations of witchcraft. The reasons were many and bizarre: one woman was accused of tying a knot in a towel and, after blowing on the knot, causing the wind to rise. Another was accused of giving someone a fish that made her sick. Another was executed after confessing (following torture) that she knew a charm for cows that yielded no milk. In reality, some of these woman and men were mentally ill. Others had the misfortune to be the target of jealousy, to have a sharp tongue, or to have children who were anxious to inherit the parent’s possessions. The trials took place at the Vardøhus Castle — really more of a fortress — and the executions were carried out there, often following torture. 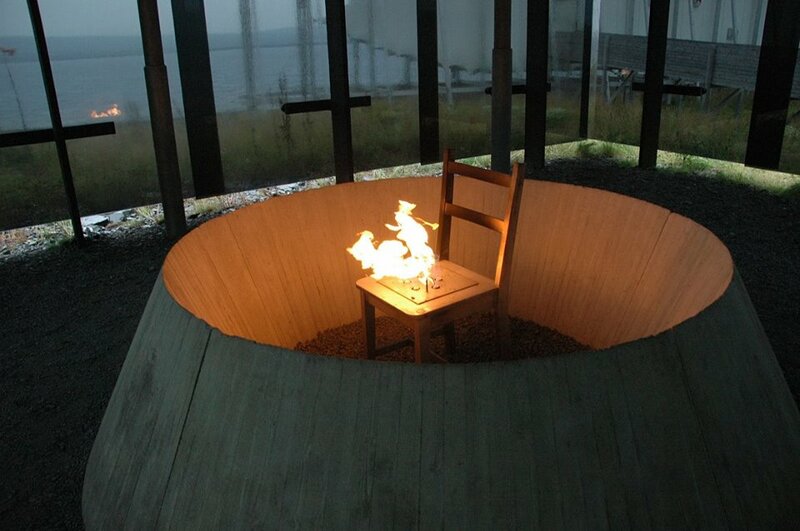 In 2011 the memorial to the witches was dedicated in Vardø. 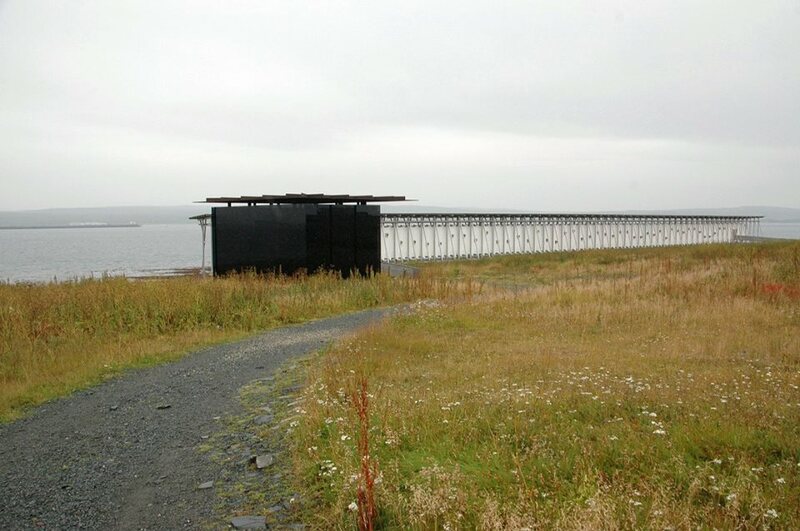 Commissioned by the Norwegian government and dedicated by Norway’s Queen Sonja, it is a joint project between the late artist Louise Bourgeois and Peter Zumthor, a Swiss architect. The fact that this monument was created reflects a changing attitude in Norway, and a sense that sins of the past must never be recreated. This will give you an idea of how bleak the treeless island is. 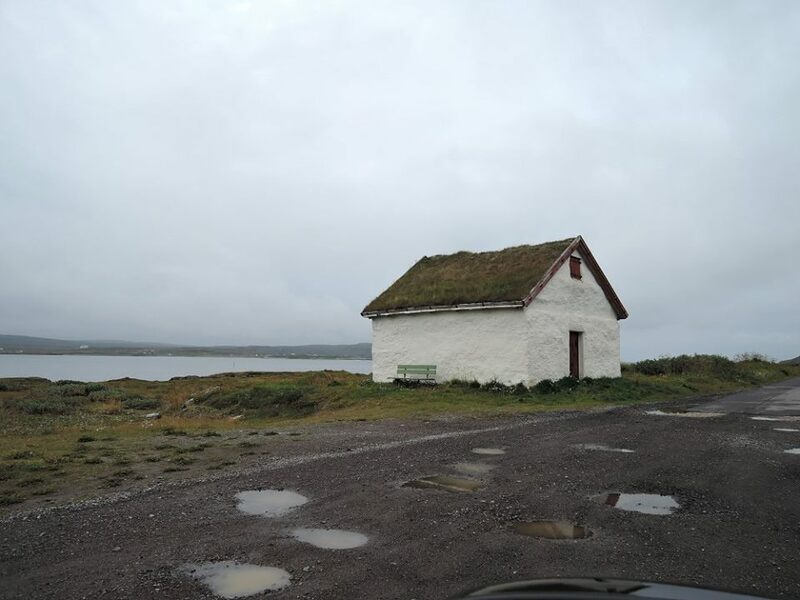 — in Vardø, Norway. Unlike many of the witch persecutions in the rest of Europe, the Catholic church was not involved, This persecution occurred almost 100 years after the Reformation, and the trials were conducted by Norwegian civil authorities. Some of the accused were Saami, the indigenous people or Northern Scandinavia. Others were likely to have been early Kven immigrants from Finland. What is remembered lives! And those who fail to learn from the past are doomed to repeat it. My first sight of the memorial was over the graveyard of the Lutheran church. 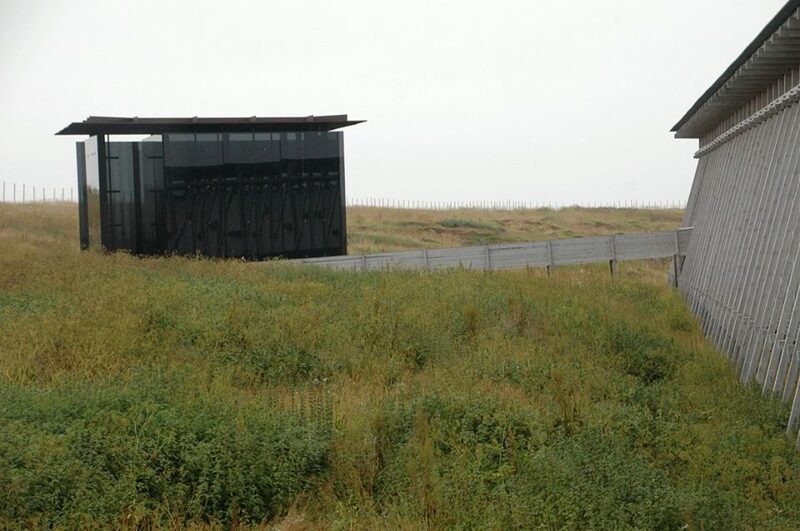 The section to the right was designed by the architect Peter Zumthor, while Louise Bourgeois designed the structure to the left and its contents. — at Steilneset Memorial in Vardø, Norway . Beyond the memorial is the section of the Barents Sea that separates the island of Vardø from the Finnmark mainland. — at Steilneset Memorial in Vardø, Norway. This is the path down to the monument. It’s hard to tell from this photo, but the most common plants I saw along the way were nettles and poison hemlock. — at Steilneset Memorial in Vardø, Norway. Zumthor took for his inspiration the wooden racks that are used to dry codfish into lutefisk to make the part of the memorial known as the memorial hall. 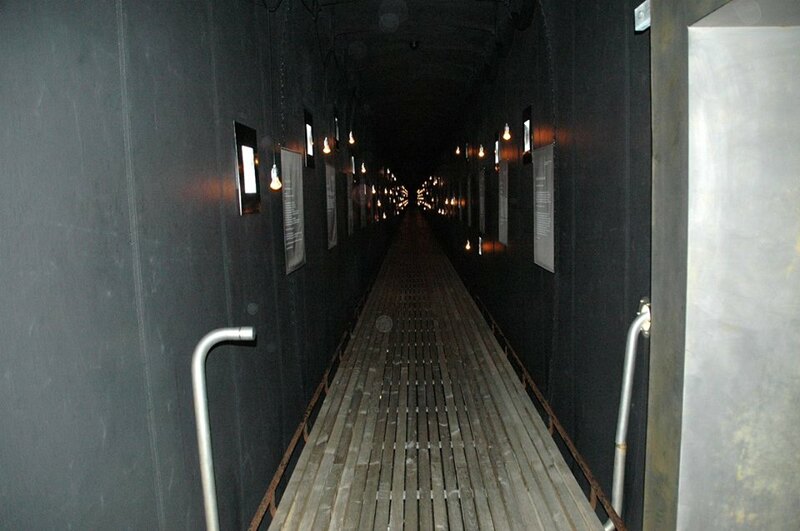 Beneath the rack-shaped structure is a canvas enclosure. Each of the small black squares you seen on the canvas is a tiny window. — at Steilneset Memorial in Vardø, Norway. 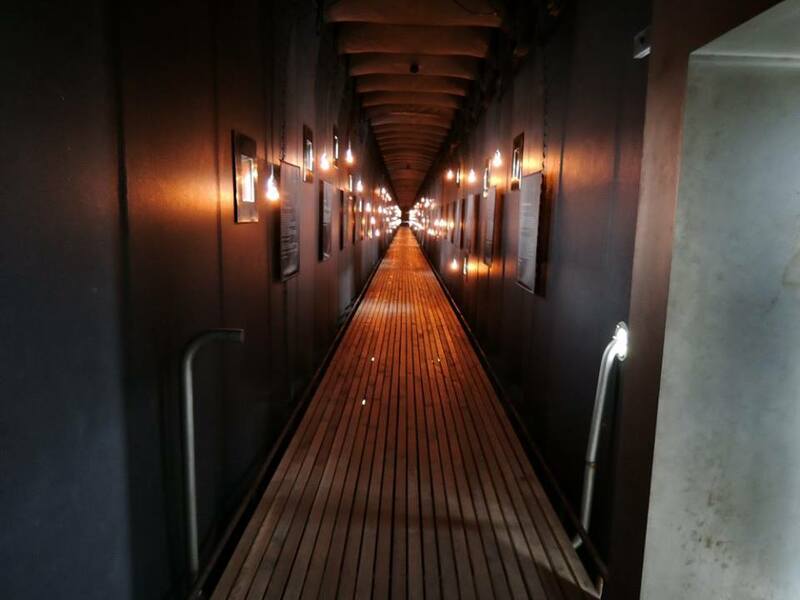 This is the first thing you see when you step inside the structure: a long corridor lined with plaques, lights and small windows. — at Steilneset Memorial in Vardø, Norway. 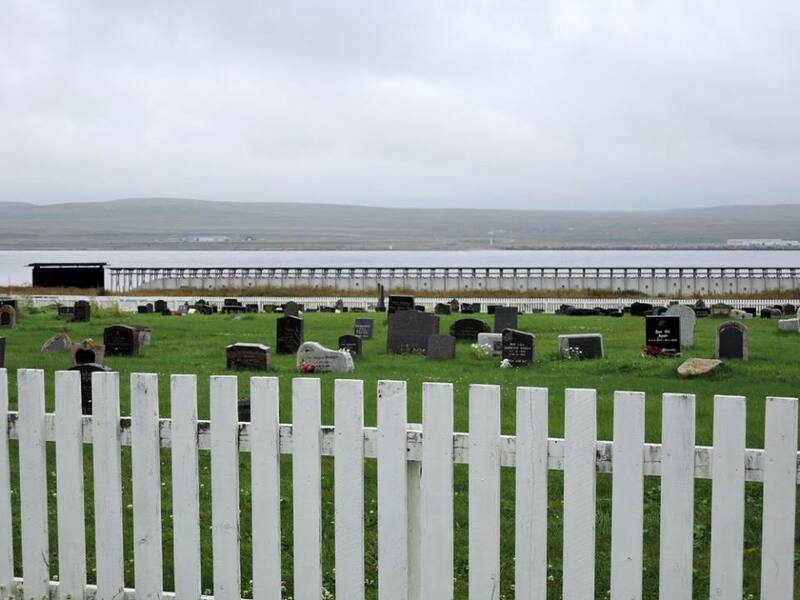 Each plaque has the name of one of the 91 who were executed here, and her/his story — at Steilneset Memorial in Vardø, Norway. 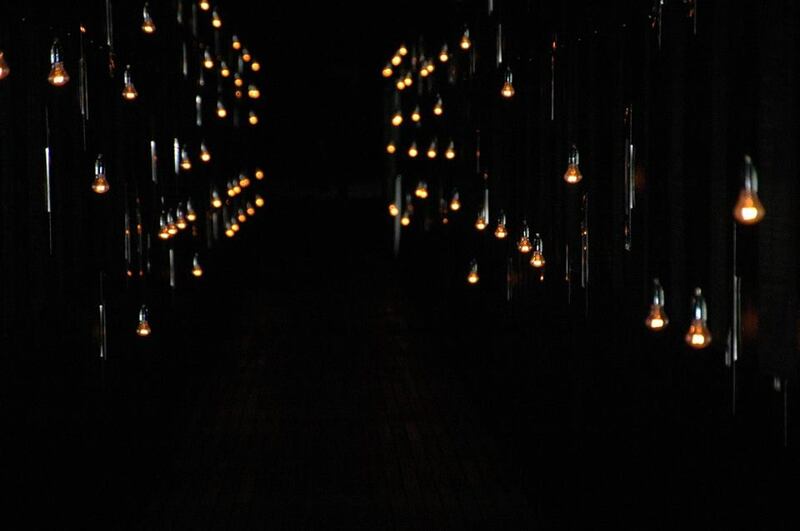 Each light represents a person — at Steilneset Memorial in Vardø, Norway. 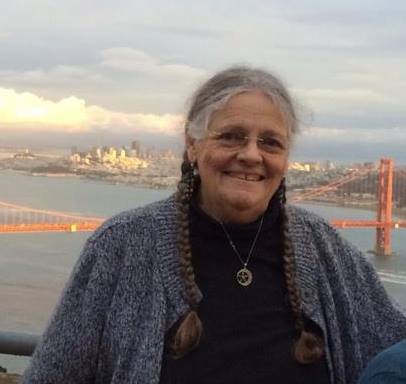 Victoria Slind-Flor is a founding member of the Coven of the Sacred Feminine in the San Francisco Bay Area, an all-women’s group that celebrates the work of women’s hands. In her mundane life, she’s a journalist covering intellectual property legal issues, and when she’s not pounding the computer keyboard, she can be found making art, photographing wildflowers, or wildly applauding San Francisco Ballet. Over the past decade she has taught workshops at a number of Pagan festivals and gatherings, and has written for a variety of Pagan publications. Although she is well into her crone years, she still dreams of climbing Mt. Rainier one day, and just knows she would have been one heck of a Viking traveler. I think it’s interesting and symbolic the way the windows in this dark memorial given a tiny hint of the life — and hope — to be found in the world outside. 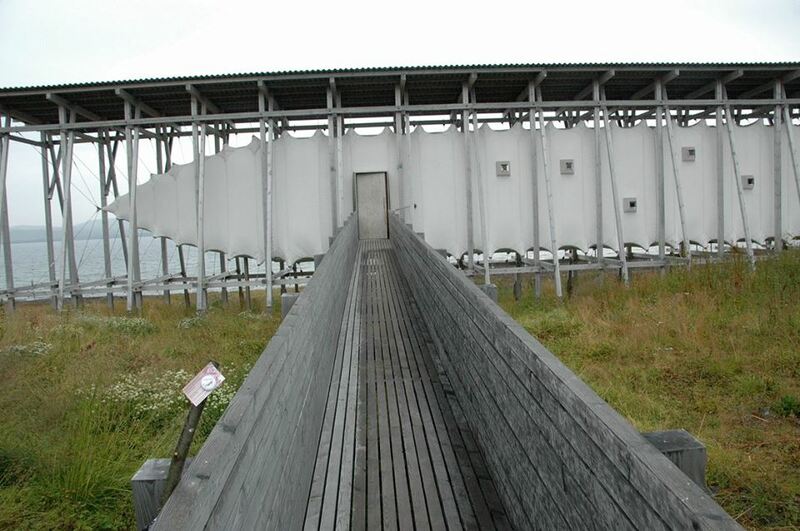 — at Steilneset Memorial in Vardø, Norway. 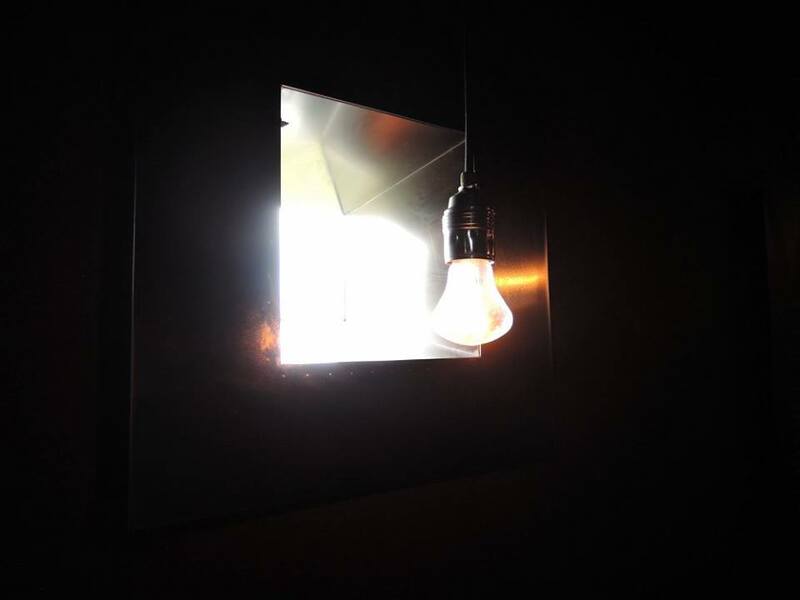 By each person’s plaque is a tiny window to the outdoors and a bare hanging light bulb. — at Steilneset Memorial in Vardø, Norway. 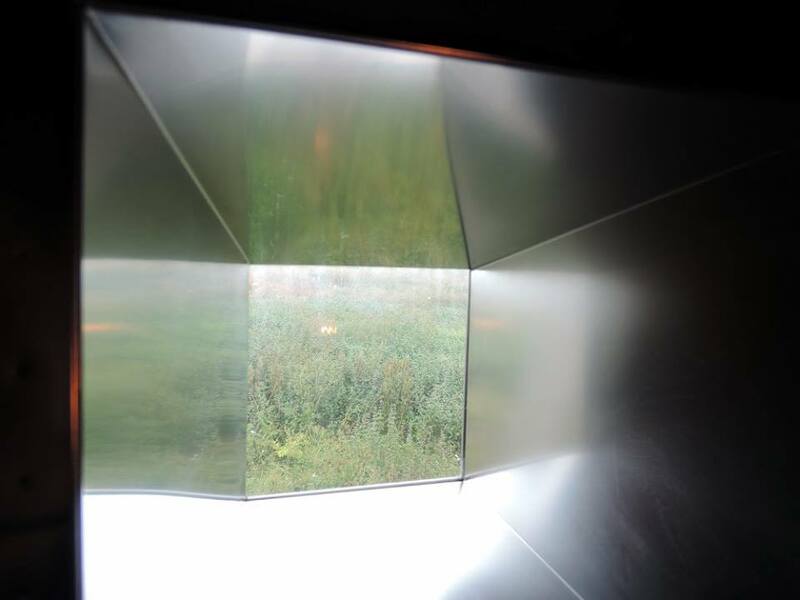 This smoked glass structure is Louise Bourgeois’ part of the memorial. It’s known as the House of Flames. The structure is roughly cubical, about 18 feet to a side. 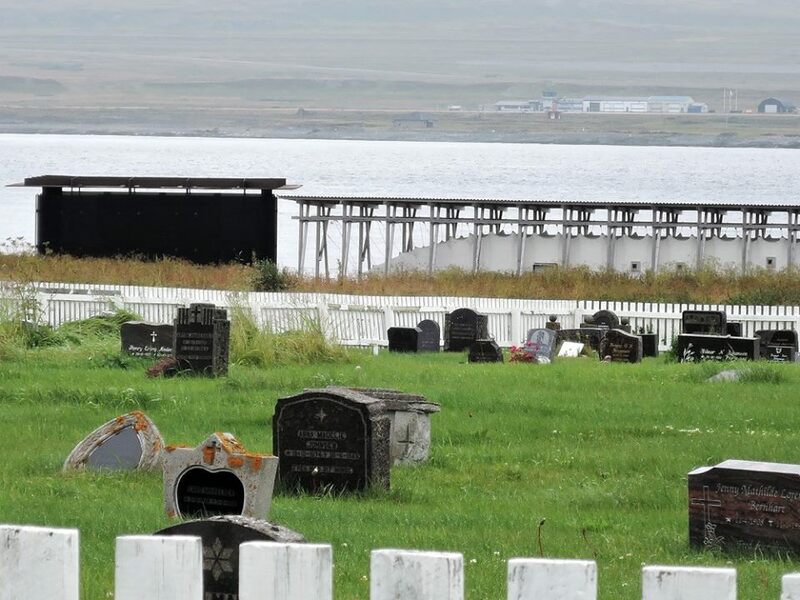 Once you’re inside, you can look out across the sea or back to the church and the graveyard. — at Steilneset Memorial in Vardø, Norway. 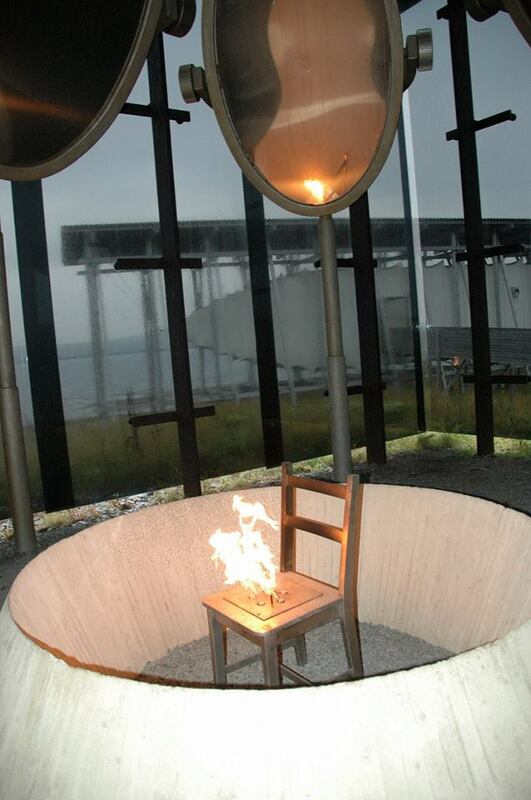 And this is the heart of the memorial: a metal chair from which flames constantly arise. — at Steilneset Memorial in Vardø, Norway. Hanging high above the chair are oval brass mirrors that reflect the light. That’s all there is to this memorial, but, in my opinion, no more words are needed. I found it to be a chilling and yet holy place. When I showed this photo to my cousin Kristin Skoglund and her husband, he got it right away. “The flames are the spirits of those who were killed, rising up away from this place,” he said. — at Steilneset Memorial in Vardø, Norway. 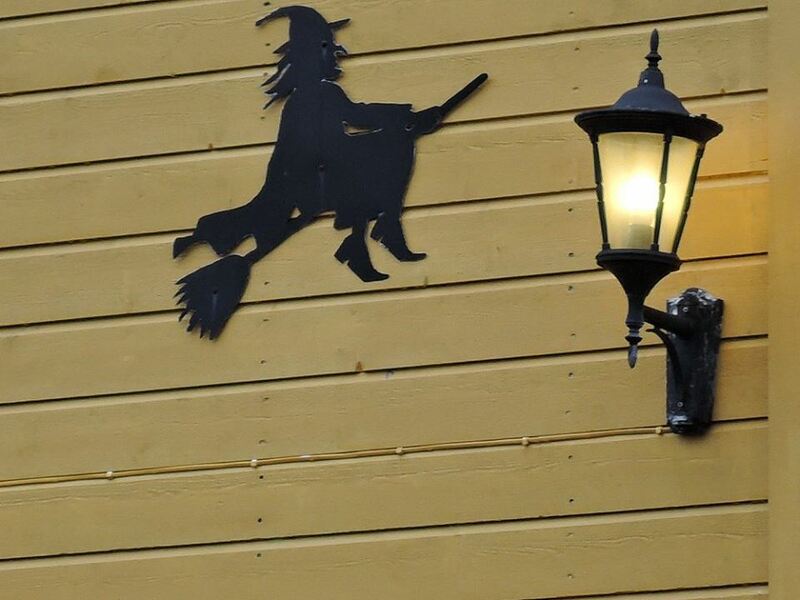 Saw this witch on the side of a house in Vardø. People here do have a connection to the memorial. Several years ago when the Norwegian national broadcaster did minute-by-minute coverage of the Hurtigruten’s trip from Bergen to Kirkenes, as the ship began to enter the harbor at Vardø, a group of women dressed as witches began to dance around a huge bonfire on one arm of the quay. I think it was that sight that made me decide I had to come here. — at Vardø, Norway. Wonderful post….but you know we were still burning witches in Scotland a couple of hundred years ago…?